A unanimous panel of the 4th U.S. 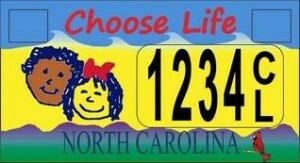 Circuit Court of Appeals ruled today that the state could not offer a “Choose Life” license plate without also offering an alternative plate with a message supporting reproductive freedom. The key question before the court in ACLU-NC v. Tata was whether the message conveyed on the license plate constitutes government or private speech. The U.S. Supreme Court has held that regulation of private speech — here, drivers expressing a pro-life view by purchasing and displaying the license plate — is subject to scrutiny under the Free Speech clause of the First Amendment. But government speech — lawmakers advocating a state pro-life position through the plates – is not. In the court below, U.S. District Judge James C. Fox found that the Choose Life plates were not a form of protected government speech but rather “were part of a larger program encouraging private speech by North Carolina drivers” and ruled that the state’s one-sided license plate scheme constituted viewpoint discrimination in violation of the First Amendment. Read the full Fourth Circuit opinion here. Well, here’s a surpise… How many taxpayers dollars has this fiasco cost us? Add this to the ever growing list of legal actions being taken against this administrations policies, they ones they apparently didn’t see coming. So much for the self described fiscally responsible conservatives. Maybe if we just stopped public funding of judicial races, we could get a more “fair & balanced” decision by judges bought & paid for by special interests…? (Satire alert). Oh, and look, there’s Tony Tata’s name right at the top. Isn’t this the same guy who used to be an “education expert” in Wake County? All part of the plan. Pass ridiculous laws that inevitably get struck down. The rubes continue to believe their godly representatives are fighting for them, and the two-bit hucksters they vote for pretend the courts are part of the grand conspiracy against the rubes. And the cycle repeats anew. Hey, let’s see if AlanML finds this comment. Are you doing your job dude?